Author: Delia Haust. Series edited by: Hans-Jürgen Sasse †, Rainer Voßen. 16 pp. Roman, 372 pp. The first part of the present study covers theoretical aspects of code-switching, using two discourse-pragmatic and two grammatical models. On the basis of these models the author develops a framework for her empirical study of the double overlapping diglossia in Gambia, where two African lingua francas serve as Low varieties in contrast to the official language English, and as High varieties in contrast to the local languages. 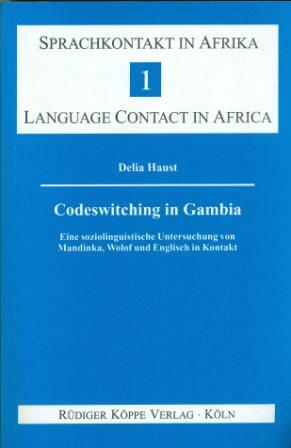 Haust includes brief sketches of the main languages involved, Mandinka and Wolof, reproduces the questionnaires and data of the informants, followed by diagrams and cross-tabulations showing the cases of code-switching. The final chapters give a structural categorization of code-switching and its sociopragmatic criteria.